Rotational Curation (RoCur) is the practice of rotating the spokesperson for a social media account that embraces many topics within a subject area. 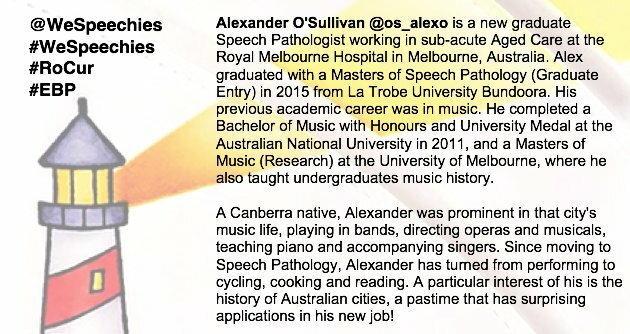 Typical subject areas are countries (Australia; Sweden), cities (Brisbane; Leeds), groups (Indigenous Australians; LBTQI people; student nurses), jobs (scientist; writer) academic disciplines (education; humanities; public health), and people with conditions (multiple sclerosis). 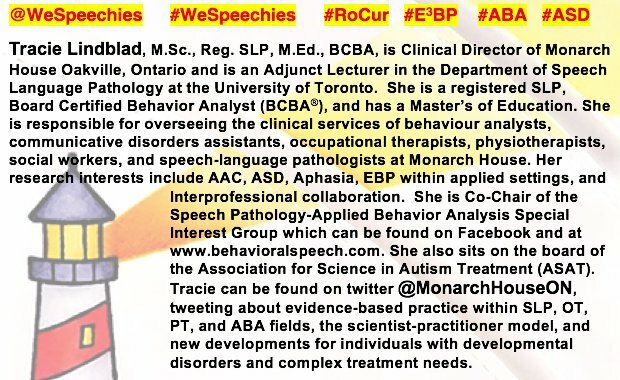 Founded in March 2014, @WeSpeechies is the first ever speech-language pathology / speech and language therapy (SLP/SLT) RoCur, as well as the first Allied Health RoCur. 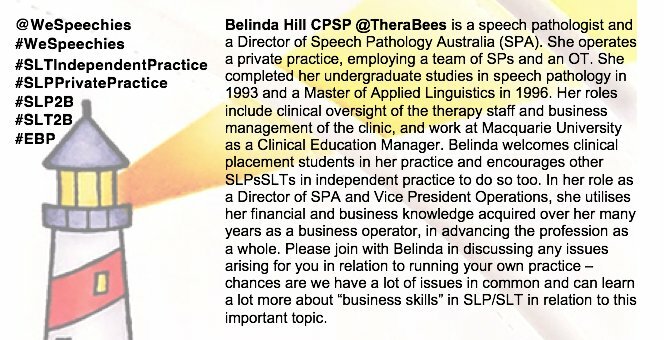 It already has a strong reputation among followers as a useful point of contact for #SLPeeps (SLPs/SLTs with Twitter accounts), #SLP2B (students), and colleagues in other disciplines. 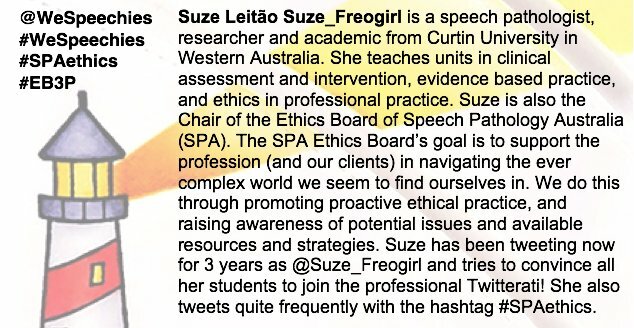 It appeals to those interested in accessing support, resources, discussion and information related to evidence based practice (EBP) and research, in a collegial advertisement-free environment. 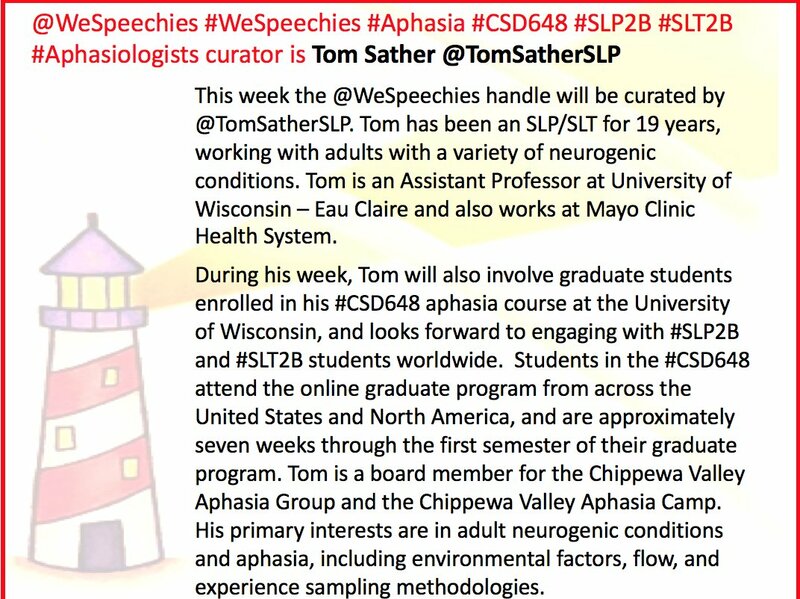 Its subject area is SLP/SLT, and using some of the As as examples, weekly topics have been academic issues, advocacy, aphasia, apraxia, and augmentative and alternative communication (AAC). Facetious, fun for wordlovers, and given to a sexist turn of phrase, vocabulary.com defines 'administrator' as 'The boss, the head honcho, the guy in charge: the person responsible for managing things and running the show.' 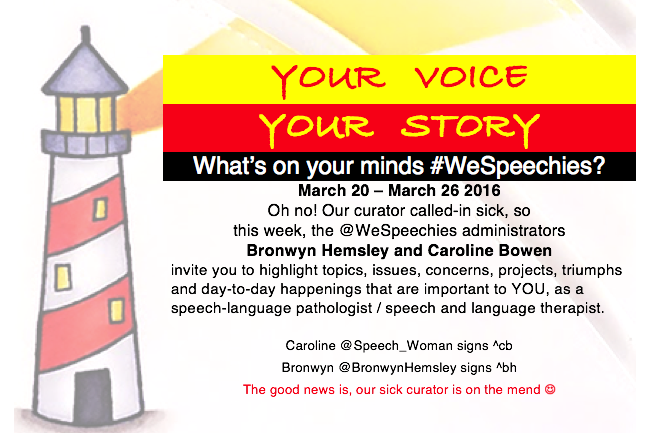 Founders and co-administrators Caroline Bowen and Bronwyn Hemsley are the guys running the @WeSpeechies show. They ensure smooth segues between curators as a new person takes over to Tweet from the handle on a Sunday, hosting discussions for a week that ends on the Saturday. 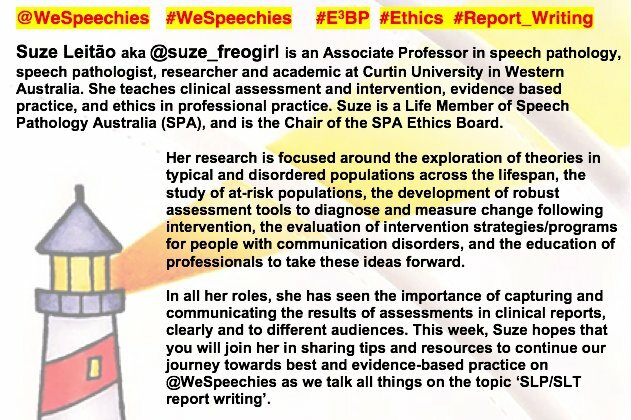 They also help curators plan, design, publicise and moderate a spirited one hour long Tuesday Twitter Chat, related to their overall topic, on the #WeSpeechies hashtag. 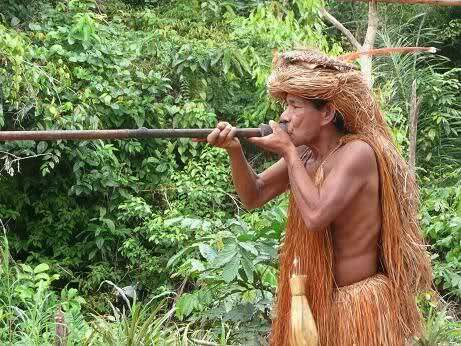 A curator (from the Latin, as opposed to 'from a blow gun': curare meaning 'take care') is a manager or overseer. Rotational Curation, usually referred to as Rotation Curation, became a thing in December 2011 when Svenska Institutet and VisitSweden initiated Curators of Sweden with the enduring handle @Sweden. 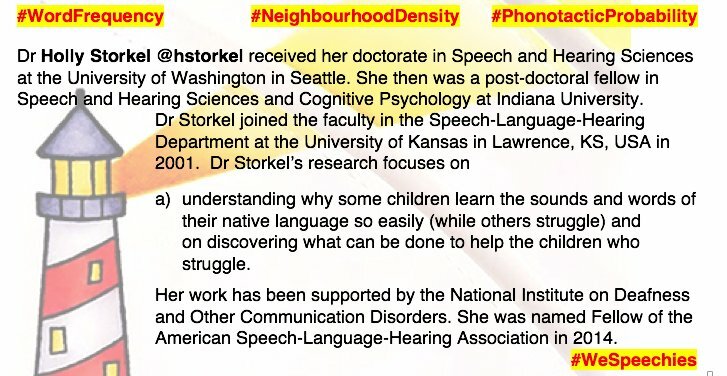 Every week, a different Swedish person assumes the responsibility of demonstrating, in English, Swedish diversity and progressivity - simply by being themselves on Twitter. The idea was emulated fast, and @PeopleofLeeds and @WeAreAustralia, which also remain active, made their debuts in the first three weeks of 2012. The RoCur model has been ported to Instagram but continues to be most conspicuous on Twitter. 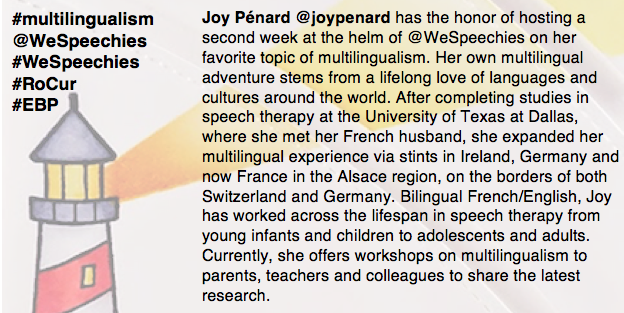 @WeSpeechies is noteworthy for its role as an SLP/SLT learning, teaching and sharing tool; for the diversity of its curators and their topics; for its multicultural Twitter following which is both international and cross-disciplinary; and for its interesting and useful content. The curators have spanned many time zones and eight countries to date: Australia, Canada, England, France, New Zealand, Scotland, South Africa, and the United States. 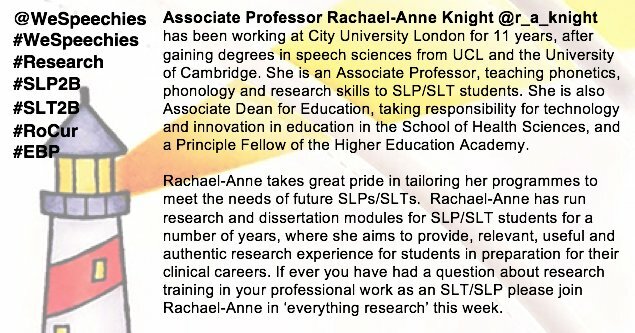 Some curators are specialists in their SLP/SLT fields, or SLP/SLT-related endeavours such as advocating as a parent for young people with Aphasia, or working in the fields of Linguistics or Neuropsychology. Others do not see themselves as specialists per se, but have unique professional backgrounds and viewpoints that shape the overall feel of their week, enriching the conversations. Singling out a few topics curated by the one-time (so far) curators: Avril Nicoll (Laurencekirk, UK) posed the question, 'Making a change in your practice: what does it take? 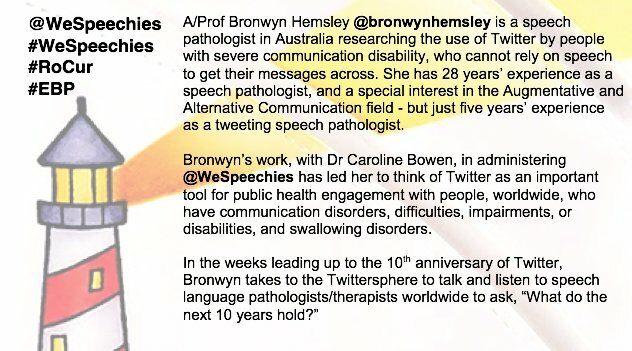 '; Felicity Bright (Auckland, NZ) explored 'Patient-Provider Communication'; Harmony Turnbull (Sydney, NSW) took on 'Plain English and Accessible Language in Practice'; Megan Sutton (Vancouver, BC) curated on 'Apps in SLP/SLT practice'; Andrea McQueen (Melbourne, VIC) inspired with 'Fostering Communication for Participation for People with Intellectual Disabilities'; while Pam Snow (Bendigo, VIC) examined 'Literacy and Language Development in Vulnerable Youth'; Susan Rvachew (Montreal, QC) unpacked the issues surrounding 'Waiting Times for SLP/SLT Services'; and Tricia McCabe (Sydney, NSW) bore the massive task of tweeting from the Speech Pathology Australia 2014 Conference. Several curators have served twice. 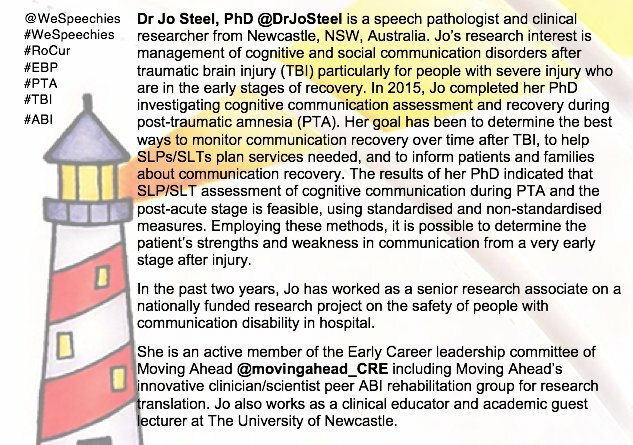 Melissa Brunner (Sydney, NSW) led weeks on 'Traumatic Brain Injury' and 'Looking for Evidence and EBP'; neuropsychologist Dorothy Bishop (Oxford, UK) curated 'Is SLI a Useful Category?' 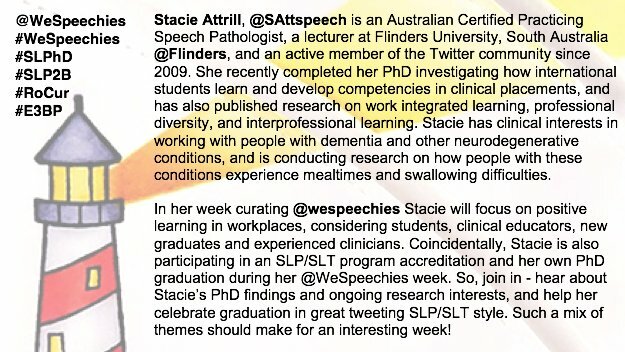 and 'Apprehensive Academics on Twitter'; Rachel Davenport (Melbourne, VIC) steered WeSpeechies through 'Work-Life Balance and the Doctoral Journey' and 'SLP/SLT Clinical Education'; Kate Munro (Adelaide, SA) curated on 'Lurking and Tweeting' and 'Mentoring and AAC Users'; and Emily Wailes (Far North Coast, NSW) chose to tweet on 'Communication Support for people with Intellectual Disability who have Challenging Behaviour' from her own handle, and about 'Assessment for AAC Systems and Tools' for @AGOSCI. 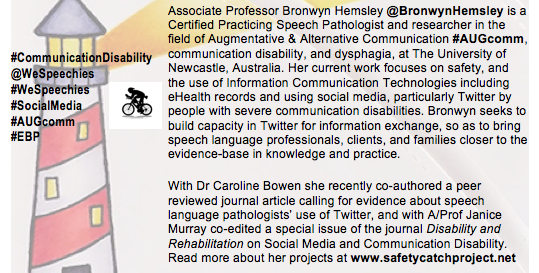 The administrators have taken a turn at rotation curation too, with Bronwyn Hemsley (Newcastle, NSW) on 'e-health solutions', SLP/SLT Terminology (with Caroline), 'Using Twitter and Social Media to Support Countries Developing AAC Communities of Practice' and 'Developing and Administering a RoCur'. 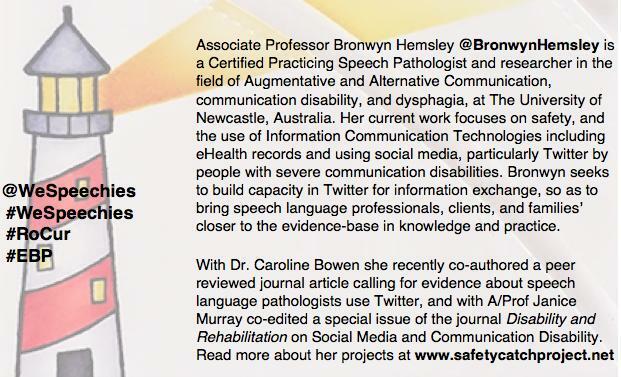 Caroline Bowen (Wentworth Falls, NSW) has led on 'Engaging in Twitter: Demystifying the Experience', 'Words, words, words: Untangling our terminology' (with Bronwyn), and 'Controversial Practices in SLP/SLT'. 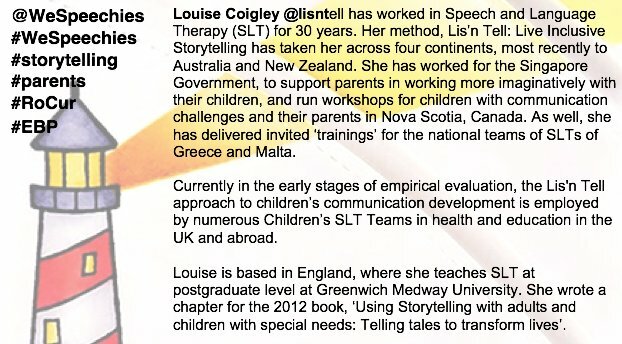 The remaining 2014 curators were Joanie Scott (Hertfordshire, UK) on 'People with Aphasia and their Families and Friends'; Jenya Iuzzini, (Boston, MA) in a week about 'Childhood Apraxia of Speech'; Nancy Owens (Canberra, ACT) regarding 'Communicating evidence clearly and effectively to inform healthcare decisions'; Nicole Whitworth (Leeds, UK) on 'Clinical Linguistics in SLP/SLT Education'; Gail Bennell (Launceston, TAS) with 'Using Video in Clinical settings, and Video Blogging'; Ariane Welch (San Francisco, CA) on 'Taking your SLP/SLT Credentials Abroad'; Sarah Masso (Sydney, NSW) with 'Translating Research into Practice, and Practice into Research'; Tom Sather (Eau Claire, WI) on 'Aphasia'; Naomi MacBean Hartley (Madison, WI) regarding 'Voice'; John McCarthy (Athens, OH) with 'Twitter in (and out of) the Lecture Hall'; Renena Joy (Halifax, NS) and 'Working with Children who have Autism Spectrum Disorder in School Settings'; Olivia Hazelden (Toronto, ON) on 'Use of Social Media from Student to Professional'; Kelley Babcock (Nashville, TN) on 'Dysphagia'; Joy Pénard (Alsace Region, France) on 'Clinical practice with Multilingual Clients and their Families'; Claire Hartley (Birmingham, UK) on 'Simulation in SLP/SLT Clinical Education', and finally the Administrators on 'What are you SUPPOSED to be doing?'. 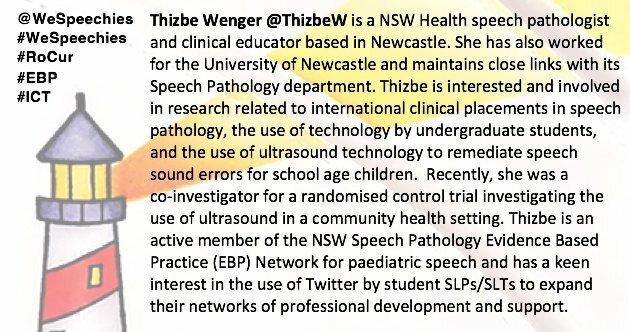 Anyone with a Twitter handle can follow the @WeSpeechies handle in order to quietly experience it in action, and unfollow if it is not for them. A handle or username is how a person or group is identified in Twitter, and like an email address, it is unique and not case sensitive. A handle begins with the @ symbol. 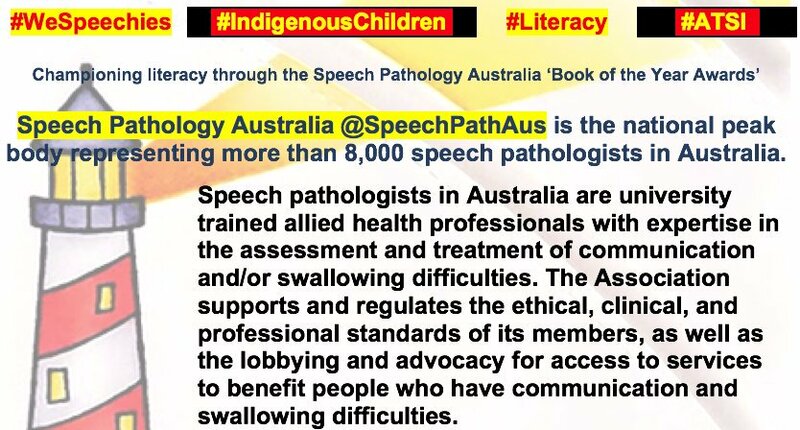 For instance, Speech Pathology Australia is @SpeechPathAus and the Australian Senate of 'Prevalence of different types of speech, language and communication disorders and speech pathology services in Australia' fame is @AuSenate. A hashtag, meanwhile, is any word, phrase or alphanumeric sequence that begins with the # symbol. Clicking on a current hashtag takes you to all the Tweets containing that same hashtag. 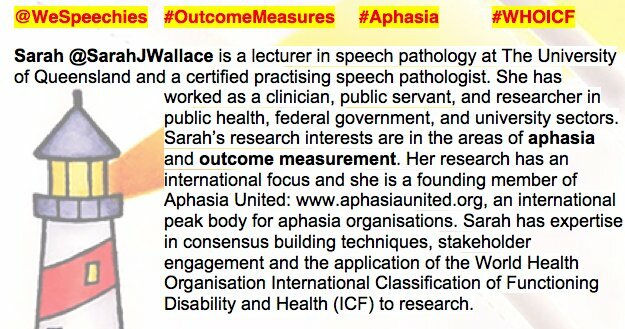 In discussions of AAC, aphasia and apraxia the tags #AUGcomm, #aphasia and #apraxia are often used. The obvious hashtag for AAC, #AAC, is unsuitable because it is used for topics that include athletics, soccer and weapons. 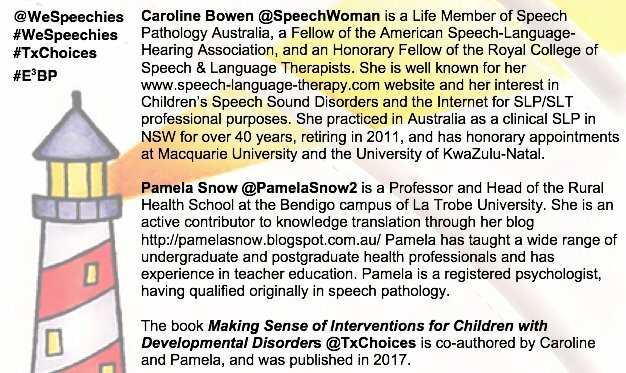 Accordingly, #AAC in the #AUGcomm sense can easily be swamped in a huge archive of Tweets that have nothing to do with #AUGcomm. Hashtags stay current if they are used and 'disappear' quite quickly if they are not. For example #ICP2014 has decayed due to disuse since the end of last year, while #GivingVoiceUK has good longevity because it is on-going and not confined to one particular year. 'Reach', in Twitter, is the sum of all users who mention a handle (i.e., have it in their timeline) plus the sum of their followers. Bruns and Moe (2014) describe three types of Tweets that help any tweeter to engage with others in different ways: Micro, Meso and Macro, with reach in mind. 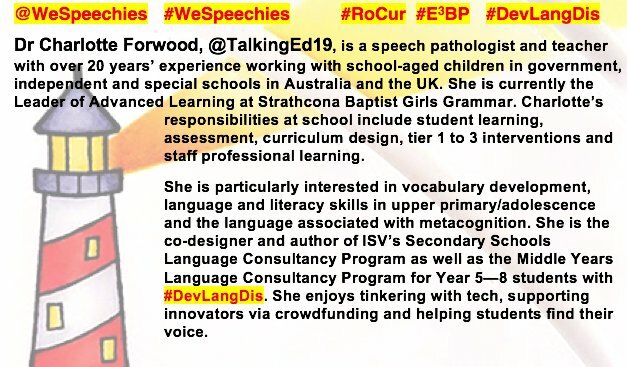 At this level the curator's (or your) reply to a follower (let's call him @EsmondSLP) is termed 'conversational' and starts with the @ symbol, like this @EsmondSLP May I Tweet you re Webwords 51, using your handle and responses as examples in the published article in Mar 2015 JCPSLP? 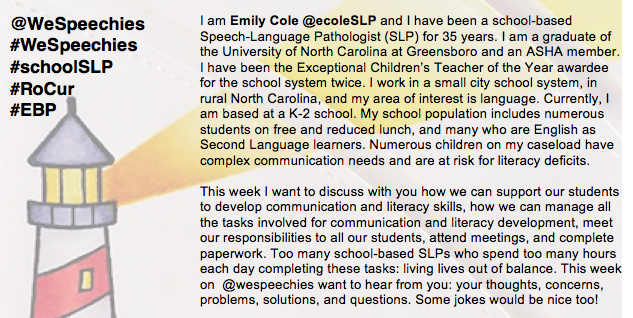 Only mutual followers of WeSpeechies and @EsmondSLP will see the Tweet in their timeline. 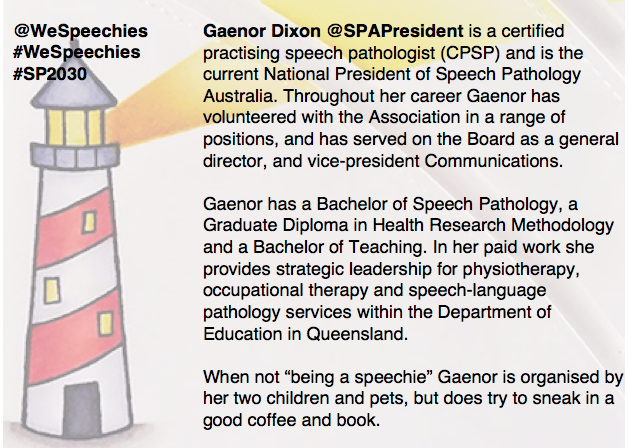 Its 'reach' is as limited as reach can be, but @EsmondSLP may like it because the tweet is directed to him, and it may even make him feel a little more special than he usually does as a bloke in speech pathology. 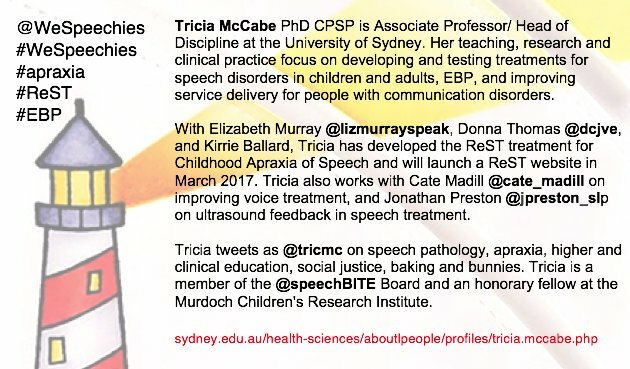 Esmond is agreeable and Tweets back at Micro level @WeSpeechies No probs :-). 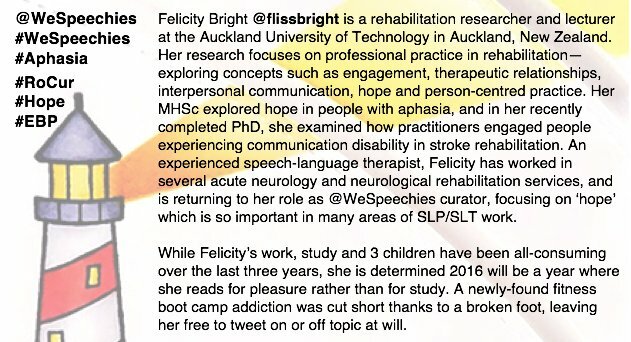 When the @WeSpeechies curators (or you) put any character or characters before the @ that appears at the beginning of @EsmondSLP like this . @EsmondSLP Thanks so much for responding Ezza, really appreciative. 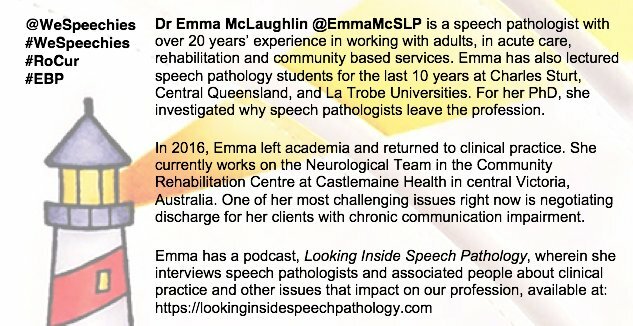 Will show you the MS before submission., the Tweet will go to @EsmondSLP and to all the people in WeSpeechies' followers network. Here, the curators (or you) Tweet a Micro or Meso level Tweet to someone and add a hashtag of mutual interest. Like this . 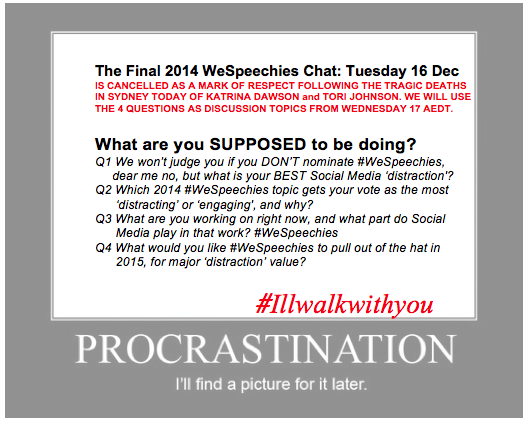 @EsmondSLP, thanks for helping with my demo about hashtags and #WeSpeechies. Then, @EsmondSLP replies to the curators, like this . 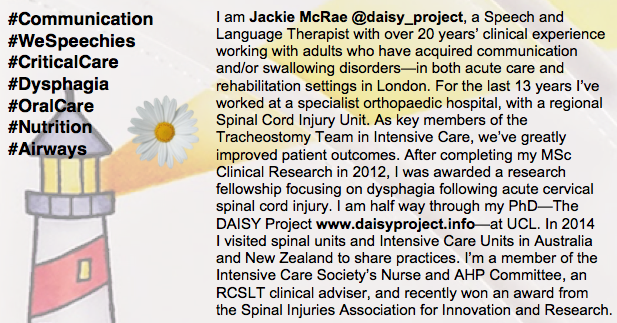 @WeSpeechies Happy to help, #WeSpeechies Love your work! 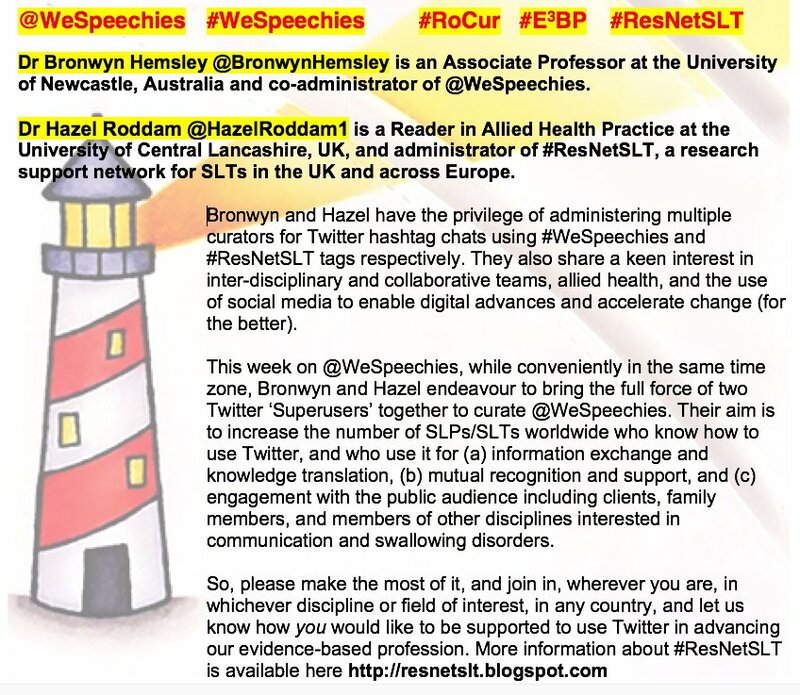 Esmond's Tweet will be seen by all Twitter users who follow the #WeSpeechies hashtag, as well as all those who click on the hashtag out of interest or curiosity. The combination of Meso plus hashtag will give the Tweet the greatest reach, amplifying Esmond's voice and the probability that his ideas will be heard. 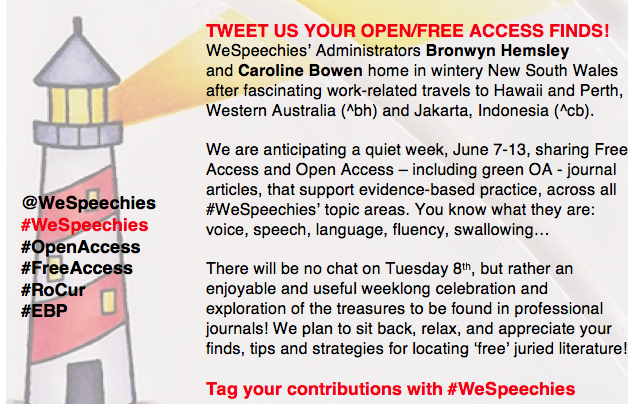 March 1 to 7 2015 was @WeSpeechies’ first anniversary week, and as many curators to date as possible were on hand to celebrate what has really been an amazing, voluntary, cooperative effort between administrators, curators and loyal followers. 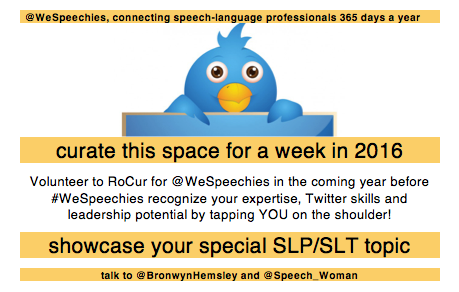 Provided @WeSpeechies attracts fresh curators, this year the range of topics expands to include aged care, change, continuing professional development, cranial nerves and oral motor assessment, craniofacial anomalies, ethics, fluency disorders, humanitarian outreach, laryngectomy, professional associations in Twitter, school-based SLP/SLT, simulated clinical practice, SLPs/SLTs in retirement, statistics in practice, Twitter in academe, working in developing communities, writing for scholarly journals, and more. 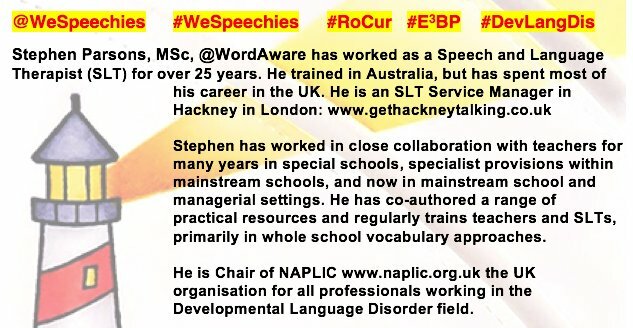 A RoCur is similar to a small professional association (e.g., @NZSTA, @IASLT), a state branch (e.g., a Branch of @SpeechPathAus), a provincial association (e.g., @bcaslpa), a regional hub (e.g., @YorksHRCSLTHub) or an independent practice association (e.g., @ASLTIP). The common feature is that they all tend to be run, with or without administrative support, by a small hard working executive who, with the assistance of committed members, offer their services freely in order to benefit the totality of the association, branch or hub. In fact, there would be no association, branch or hub without such people. 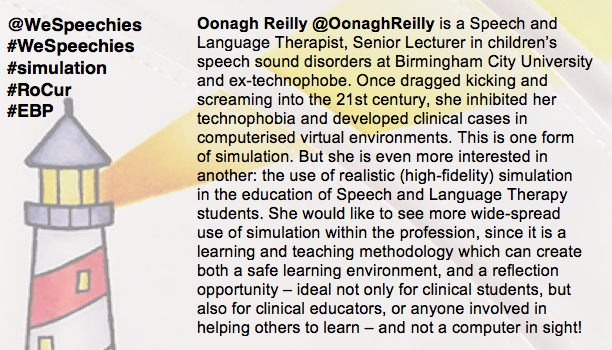 Similarly, @WeSpeechies is only made possible by the few who contribute knowledge, time, effort and enthusiasm to enhance the wider speech-language-hearing community’s learning. 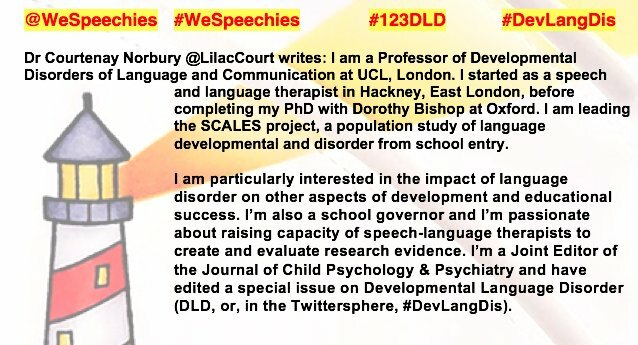 What a satisfactory development it would be if even a small percentage of Webwords’ readers decided to take part in @WeSpeechies in three ways. First, by following the handle, actively engaging in discussions and chats relevant to them, thereby shaping its future at ‘consumer and contributor’ levels. Second, by taking a turn as a curator and elaborating a topic that is important to them. Third, by thinking about becoming an Administrator for a period. Among the appealing features of Rotation Curation are its vitality and variety, with the followers dipping in and out of discussions according to their needs and interests, with the job of curator being handed from one host to the next, and with the guys who run the show knowing when it is time for new head honchos to take charge. 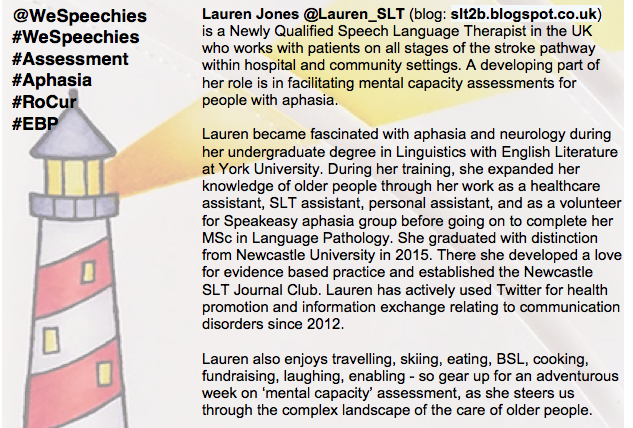 Further information about WeSpeechies is available at www.speech-language-therapy.com. Bruns, A. & Moe, H. (2014). Structural layers of communication on Twitter. Twitter and Society, 89, 15-28.